During Corgi Hosiery Week we've looked at the history of Corgi and fine examples of the socks they produce. Now let's find out a little more about the conception of those socks. Over a pot of Assam and a plate of Welsh cakes, Young Mrs Tweed spoke with Corgi's Head Designer, Lisa Wood. Lisa is the great-great-granddaughter of founder Rhys Jones. Lisa obtained a degree in Design from Leicester University. She says she is fortunate to be part of Corgi, and be able to balance her work with her family life. but perfectly formed, design team we have here. I work with the team to produce the designs and also monitor quality levels throughout the production process. My role does involve some travel as I have to meet the various buyers and designers we work with and also attend trade shows – it all sounds very glamorous but I can assure you that there’s a lot of work involved." Thanks to Lisa for answering our rather exhaustive list of questions. How has Corgi managed to survive for 120 years? Through hard work and commitment. Of course, there have been tough times but, when you’re managing a family business with as much history and heritage as ours, you have to do everything you can to keep it going and indeed developing. I think we’ve managed to stay true to our heritage, but we've continued to move with the times through introducing new products and the like. In fact, with each generation of the family, there has been some significant change that has driven the company forward. Since Chris and I joined the company, we have introduced new finer weight socks that have helped us increase both the turnover and profitability of the company. The most important factor, of course, is our loyal and highly skilled workforce, many of whom have worked for us for 30 years. The Jones family runs Corgi, do you also own the company? Can you explain Corgi's association with Dents? We part-own Corgi - our sister company Dents also holds a stake in it. When Chris and I took over the running of the company in 2008 we wanted to concentrate on expanding the business internationally and increasing export activity – working alongside Dents has allowed us to do that. It made sense that we worked with them as there are a lot of similarities between the two businesses – we both have a long heritage and a luxury customer base. How do you arrive at new designs? Do you often refer to your archives? It’s a combination of both really. There are some classic designs in our archive that are still very popular so it makes sense that we re-use these. We do like to update the designs slightly along the way though. In terms of coming up with brand new designs, we take trend forecasts and what’s happening on the catwalks into consideration. We do try to be a bit quirky though, so aim to come up with unique colour combinations and different motifs – these are the things that will make us stand out in the marketplace. 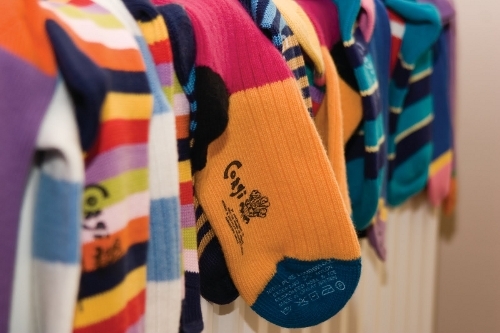 Could you talk us through Corgi's innovations in sock making? 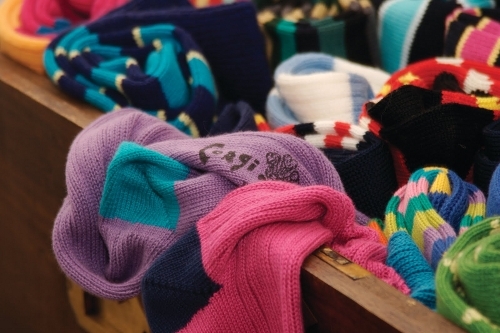 How do you differentiate from other sock and knitwear manufacturing companies? The way we work is to combine traditional knitting methods with more modern ones – so while high-tech machinery may be used for part of the production process, all of our socks are hand-finished using age-old hand-linking tools and techniques. It is this combination of the two that differentiates us from other companies. How do you preserve Corgi's heritage, yet continue to innovate? It’s a fine balance, but both aspects are important to the overall image of the company, so it’s key that we tend to consider both in equal measure. What are your biggest markets? Our biggest market is in the UK, followed closely by the United States. We also have a following across Europe and also in Asia, especially Japan where Corgi is a well-known brand – the Asian market, in particular, is an area we are currently concentrating on developing. What designers have you produced socks for in the past and most recently? We have worked with many designers over the years to make both knitwear and socks - names like Ralph Lauren, Tommy Hilfiger, Thom Browne, Vivien Westwood, Jasper Conran, Burberry and Hermes are probably the best known. We also work a lot with up-and-coming British designers as it is very important to us that we help the British design stars of the future get a foothold in the very competitive fashion industry. What are your most popular sock styles? These change from season to season and from year to year but, overall, I’d say that our heavy-weight, machine washable pure cotton socks are the most popular. 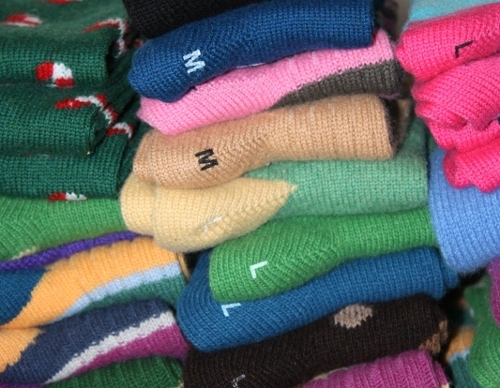 We are especially well known for our luxury cashmere socks too though. In terms of pattern, stripes do well season after season. Our newest product, the fine-weight cotton socks have seen a huge increase in sales this year and we are sure that this will continue to expand rapidly. Have preferences for particular socks changed over time? Socks have always been the ideal way to inject a bit of colour and personality into an otherwise dull outfit, but in recent years this has become more and more fashionable – nowadays, brightly coloured socks with eye-catching patterns are an office-wear staple. For those readers who are not aware of your knitwear, what could you tell us about it? Every piece of knitwear we manufacture - whether it be a men's basic sweater, a cashmere duffle coat or a luxury cashmere wrap – is of the very highest quality, made from the finest raw materials and produced with care, pride and dedication to age-old knitting techniques that have been passed down through the generations of the Jones family. Corgi expanded into knitwear in the 1960s. On average a single sweater will take up to a day to produce. The knitting patterns are written by in-house designers, then each garment is made from a number of fully-fashioned pieces (front, back, sleeves) that are carefully hand-knitted on flat bed knitting machines. These pieces are then linked together by a team of hand-linkers before being passed on to the hand-sewers who finish the garments, attaching buttons and zips, and then carefully sewing all ends. All garments are then carefully laundered before being labelled, packed and shipped to customers.